George W. Bush assumed office as the 43rd president of the United States after Bill Clinton’s successful two terms. Before his presidency, Bush was the governor of Texas, a position he held from 1995 to 2000. Bush’s election was mired in controversy, and while he received more electoral votes, he also received fewer popular votes than his opponent, Al Gore. In fact, Bush is only the fourth president to win an election despite receiving less popular votes. He is also known for being the son of a former president; the only other president with this distinction is John Quincy Adams. Bush graduated from Yale University in 1968 with a history degree. He was involved in athletics throughout his childhood, and at Yale he was a cheerleader. Additionally, he was elected as the president of Delta Kappa Epsilon, and he was a member of the Skull and Bones Society. After Yale, Bush earned an M.B.A. from Harvard Business School. He joined the Texas Air National Guard in 1968 and served two years of active duty as a pilot. In 1977, Bush married Laura Welch after a whirlwind three-month courtship. Together they had two fraternal twin daughters in 1981. In 1994, Bush campaigned for the Texas governorship. He focused his campaign largely on welfare reform, crime reduction, and the state education system. Previously, he had worked on his father’s campaign for presidency, including serving as an adviser and media liaison. 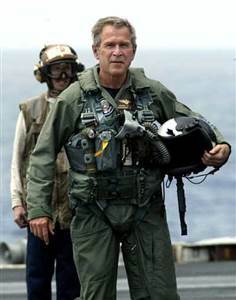 He began receiving criticism in his second term because of the continued war in Iraq, his delayed response to natural disaster Hurricane Katrina, and the start of the 2007-08 financial crisis. During his presidency, Bush was responsible for the Patriot Act, “partial-birth abortion” ban, and No Child Left Behind Act. He also signed into law tax cuts to help stimulate the economy, and he provided funding for AIDS relief. Bush was arrested for driving under the influence of alcohol, and he had his driver’s license suspended in his younger years. He stopped drinking alcohol in 1986, a fact he attributed to his wife’s good influence. Bush has a well-known love of reading, and during his presidency he read more than 186 books. He is said to be especially fond of serious historical nonfiction as well as biographies. In addition to reading, Bush began oil painting after his presidency.